The inspiration for Traveling Fish came from a famous cartoon “On the Internet, nobody knows you’re a dog” by Peter Steiner, which was published for the first time in New Yorker magazine in 1993 and remains the most reproduced cartoon in the history of the publication (Cavna 2013). During the early years of the internet, the anonymity online was a fact. However, the known cartoon cannot be applied to describe net-culture today, which is seen as a panopticon instead. Drawing also on the thoughts of Marc Auge (2008), who talks about excess of space, time, and ego in his book Non-Places, for us as artists it was exciting to translate the ideas of multi-presence and travelling the world without leaving your living room into an artwork. Hence, we have modernised the quote for me as follows: on the internet, you can be everywhere. And we asked myself questions, like what if a fish could navigate the internet and travel through a city? Hence, Traveling Fish as the name suggests is a fish that travels the world online. 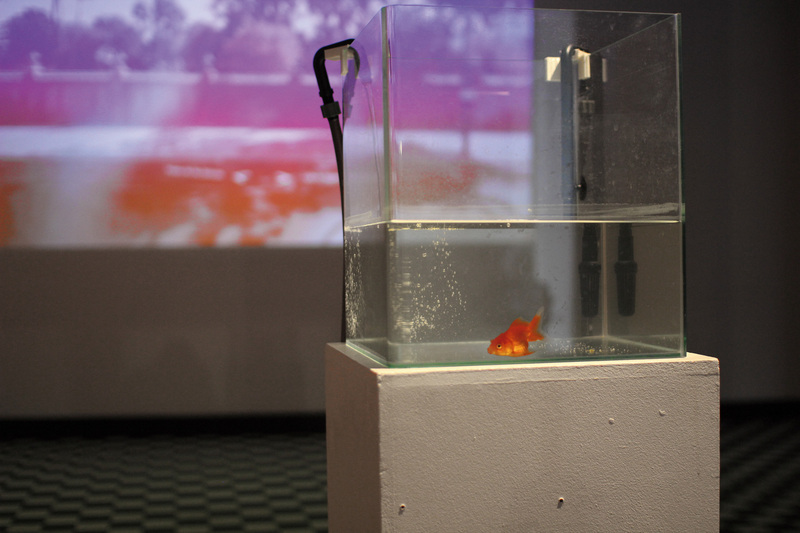 A golden fish in an aquarium is placed in the middle of the exhibition space, above which is fixed a camera for tracking the fish, and a projector. 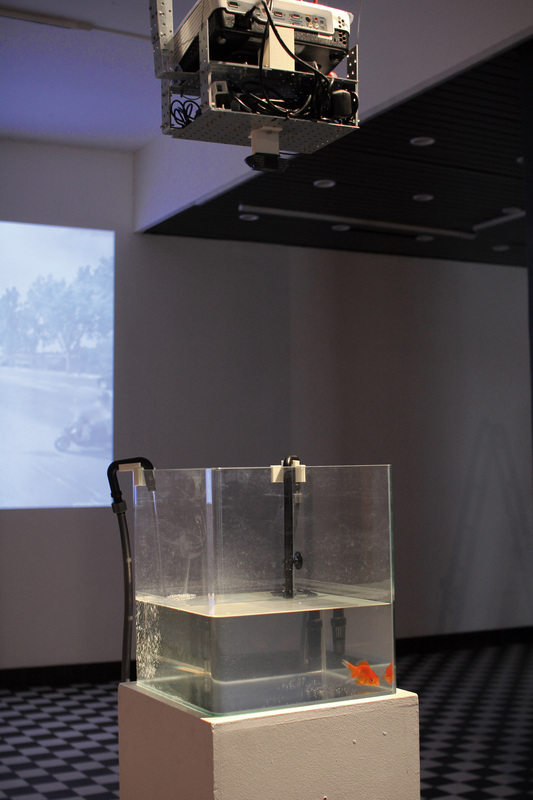 The projector displays the image of the Google Street View of a city, which follows the fish movement. If the fish goes left, right, front, or back, the system progresses in the virtual street according to the direction the fish goes. Moreover, the Google Street View is made to look like underwater, which adds the impression that the fish can indeed go for a swim in Tallinn or somewhere else. 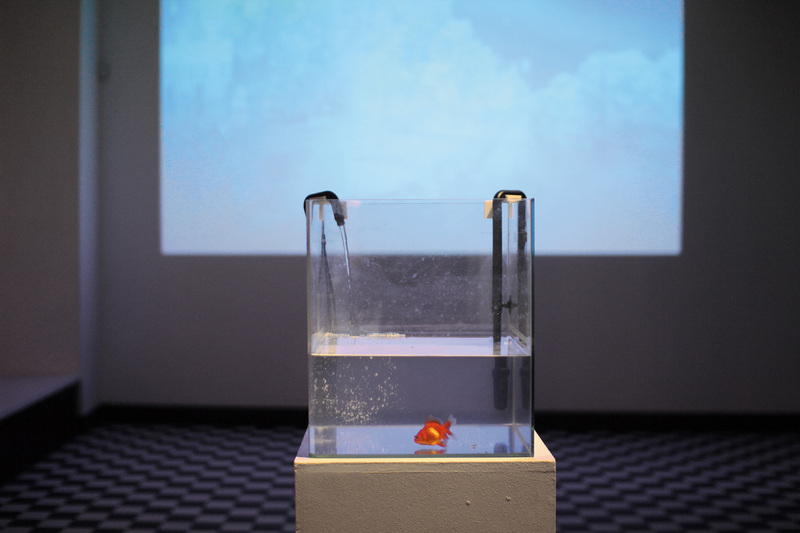 Thus, without knowing, the fish is given the freedom to undertake a virtual voyage in a city, and it also curates the image content on the wall. At this point, the audience is left in the passive role of observer, who is invited to join the travel and discover where the fish goes. It should be emphasised that converting a spectator into an observer is done on purpose to mirror the paradigm of the post-digital age: traveling and being everywhere without leaving a physical location. It becomes normality to think that there is no place where a Google car has not already been and brought the gran vista to us. Thus, our idea was to raise a question about the excess of time, space and ego, but also whether we should be a passive sheep of giant companies, like Google, and count as sufficient and valid the views and realities we are offered. 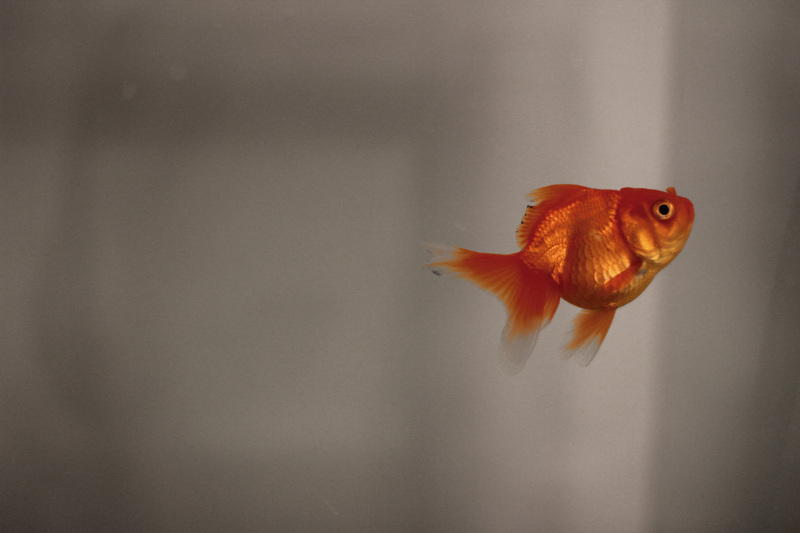 Traveling Fish emphasises the mind shift in regard to an endless voyage from a living room with an internet connection. Since the installation is made to look like its underwater, the artwork can also be perceived as an apocalyptic view of a city entirely covered with water where only fish and sea life have survived and have taken over control. Solo show at Design and Architecture Gallery (Hispano Fest, Tallinn, Estonia, 13th-22nd March’14). Supported by Spanish Embassy in Tallinn and CAF.